Trafalgar Square, at the heart of London, is one of the city’s most vibrant open spaces. Home to Nelson’s Column, the square is rich in history and provides a platform for new artistic performances and events - visit their events pages to find out what's on. We hope you enjoy your visit to London’s most famous square. Trafalgar Square's 200-year history has been one of constant change, as the original layout has been modified and updated. Find out more about the square's history on this page, and about its monuments, statues and fountains on the In and around the square pages. From the 14th to the late 17th century, much of the area occupied by Trafalgar Square was the courtyard of the Great Mews stabling, which served Whitehall Palace. In the early 18th century, the mews was put out of use by the Royal Household and the area was cleared. In 1812 the architect John Nash set about developing a new concept for the space as part of his improvement plans for London. He wanted to develop ‘a new street from Charing Cross to Portland Place … forming an open square in the Kings Mews opposite Charing Cross’. He wanted the space to be a cultural space, open to the public. In 1830, it was officially named Trafalgar Square. Throughout the 1800s, the area in and around the square went through some major changes. In 1832 work began on the National Gallery, based on designs by the architect William Wilkins. Once this work was completed, in 1838, Sir Charles Barry (architect of the Palace of Westminster) presented a plan for the development of Trafalgar Square. Barry’s proposal included an upper terrace next to the National Gallery and a lower level square, linked by a staircase and including the Nelson memorial statue and two fountains. In 1843 Nelson’s Column, designed by William Railton, was erected, and in 1845, the fountains were built based on designs thought to be by Sir Charles Barry. 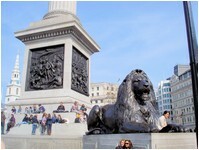 Sir Edwin Landseer designed the bronze lions that were placed on guard at the base of Nelson’s Column in 1867. In 1876, the Imperial Measures - detailing inches, feet, yards, links, chains, perches and poles - were set into the north terrace wall. When the central staircase was added, the measures were relocated, and you can now find information about them outside the café on the square. Trafalgar Square is a site of significant historic value and its monuments and statues also have individual heritage classifications. Since its construction in the early 1800s, Trafalgar Square has been seen as a centre of national democracy and protest. Rallies and demonstrations are frequently held at weekends on a range of political, religious and general issues. The Mayor supports this democratic tradition, and gives access to the square for such causes - see Managing the square.